SAP (malleus) - a serious infectious disease, belonging to the group of zoonoses, proceeding with the skin, mucous membranes, muscles and internal organs. Etiology. Exciter Sapa - gram-negative Bacillus, dispute and capsules does not form; moderately persistent in the environment, quickly perishes under the influence of disinfectants. Epidemiology. SAP is a disease of one-hoofed (horses, Asses, mules, zebras and other), which often occurs in chronic form, less often in sharp education nagnaivajutsja ulcers of the mucous membrane of the nose. The selection of these sores are contagious. People often gets infected by horses. The pathogen enters the body through the damaged skin and mucous membranes. Celebrated the professional nature of the disease, observed mainly among grooms, veterinary workers, jockeys, herders and others Encountered sporadic cases; possible group of the disease. Pathogenesis and pathological anatomy. In acute Sapa develop nodules of granulation tissue in various organs and tissues, followed purulent meltdown and the formation of abscesses. Chronic SAP flows from the man in the form of chronic sepsis with polyarthritis, abscesses in the organs and lead to amyloidosis internal organs. Fig. 1. Chronic form Sapa; ulcerative process on the lower extremities. Fig. 2. The defeat of the person in Sapa. Ulcer and purulent nasal discharge. Fig. 3. The acute form Sapa; numerous pustular rash. The clinical picture. The incubation period of acute Sapa - 2-5 days, rarely 2 - 3 weeks. Onset of acute-with chills and fever. Appear muscle pain, joint pain and swelling. Typical septic course of the disease with the wrong type of fever. In the area of the entrance gate infection produces a reddish-purple papule with an area of redness. Then papule transformed into pustules with bloody contents. 1-3 days the pustule is broken, and is a plague (Fig. 5). Develop necrotic foci in the muscles, especially the calf. In light develops pleuropneumonia, accompanied by cough with bloody sputum; there are bloody and greenish purulent nasal discharge (Fig. 6). State of patients with severe, progressive worsening. Acute SAP always flowing hard, usually ends in death. Chronic SAP occurs in three forms: cutaneous, lung and nasal. 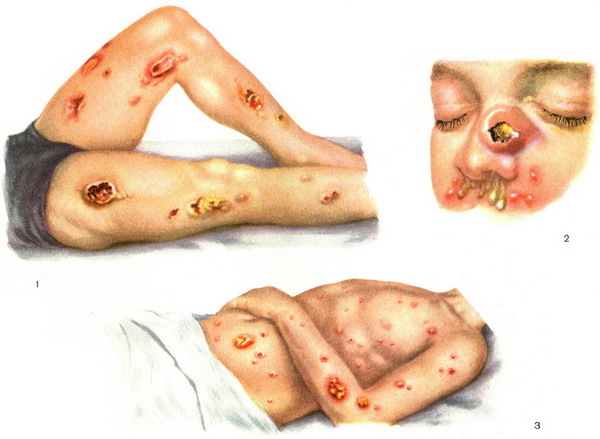 The disease develops gradually, characterized by multiple change of the periods of exacerbation and remission. Long - from several months up to 2 - 3 years and more. The forecast is unfavorable; mortality reaches 50% and higher. The diagnosis. At a substantiation of the diagnosis data of clinical examination, epidemiological history (contact with horses, ill low glanders) and the results of laboratory research of the contents of pustules, Pankratov. A person who has low glanders necessarily hospitalized. The differential diagnosis spend with furunculosis, gangrenosum, smallpox, sepsis, syphilis, leprosy, rheumatism, pneumonia, abscess and tuberculosis, pulmonary forms of plague and anthrax. Treatment Sapa symptomatic and tonic, vitamin therapy. Need good nutrition, good care. Local treatment - searing Sanych nodes, ulcers caustic potash, carbolic acid, termoautonomo, opening muscle abscesses. In chronic Sapa - autovaccinotherapy. Antibiotics are shown in the event of the accession of secondary infection. It is noted certain efficiency of sulfatiazola. Prevention includes conducting the veterinary-sanitary and health interventions. When identifying horses, patients with low glanders destroy them immediately. The farm, which revealed a sick horse, all the other horses with unclear clinic of the disease and with a positive eye breakdown (allergic diagnostic breakdown) put a reaction of binding complement (see Board - Zhang reaction). In case of positive reaction of these horses are destroyed. In case of negative reaction the horses are checked every 15 days before the announcement of the economy prosperous. Disadvantaged farms manure, litter and feed residues are burned. Premises and objects of care of horses are disinfected with 3% a solution of crealine or phenol. Persons serving this economy, it is forbidden to smoke or eat during work. Hands before eating wash with warm water with soap. Shoes wipe 1 % of the activated solution of bleach. Clothing is prohibited to take home. A sick person hospitalized in an isolated ward. Medical staff are dedicated to patient care, working in gloves, and when the lung form in the mask and glasses-canned goods. At the bedside is current, and after his discharge final disinfection (boiling dishes in 2% soda solution, swelling, underwear and bed linen, chamber disinfection of bathrobes, mattresses, blankets, wet processing facilities (3% solution of Lysol). For people to communicate with patients, established surveillance for 15 days. Specific prevention is not developed.